Horizon has rescheduled its plans to debut its new superyacht, the 33.53m Horizon RP110 superyacht Andrea IV, at the Fort Lauderdale International Boat Show due to a shipping delay. The Taiwanese builder's brand new model, the Horizon RP110, was three years in the making, two of which were spent perfecting the innovative double chine hull, which provides excellent seakeeping and stability alongside shallow draught. Hull No 1, showcasing a Marty Lowe interior, will now go straight to Palm Beach, Florida, upon her arrival in the US. From this base, Horizon USA plans to host an Open House for the press on Andrea IV mid-November. 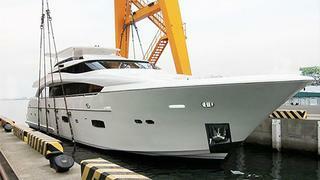 Her official world debut has been rescheduled for the Palm Beach International Boat Show 20-23 March, 2014, and will be available for tours dependant on her owner's schedule. Horizon will still be showing four yachts at FLIBS, its E88 and E56 motor yachts, PC60 catamaran and now the EP69 explorer yacht joins the lineup – all available to see on Bahia Mar's F Dock, slips 600-604.